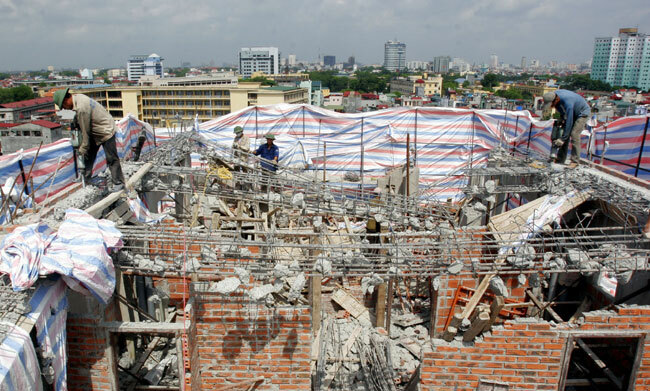 HA NOI (VNS)— A decision to approve illegal buildings and unapproved extra floors if their owners pay a fine has been surrounded with controversy since being announced recently. Unless something is done, the decision, announced in a Ministry of Construction circular, will be applied next month. The situation at present is that a person who, without permission, builds a new building - or an extra floor on top of his home - can be fined up to 50 per cent of the value of the work in addition to other administrative fines. The offending structure must also be torn down. The new circular stipulates that the structure be allowed to exist if it does not damage or intrude on adjacent properties and fines are paid. According to Architect Dao Ngoc Nghiem, vice head of the Ha Noi Urban Planning and Development Department, the existence of illegal structures was due to poor management by the State. Thus, he said it would be a big contradiction to allow illegal works to remain. "The Ministry of Construction should not issue such a document as it reveals its lack of management in urban construction," Nghiem said in the An ninh thu do (The Capital Security) newspaper. Nghiem added that illegal structures could destroy city street scapes. Similarly, Viet Nam Federation of Civil Engineering Associations vice president Pham Sy Liem, said that the fines would not be heavy enough to deter violators. He suggested they be raised to 100 per cent of the cost of the illegal building work. Meanwhile, Do Duc Duy, a ministry spokesperson, admitted that controversy surrounded the document. He said many people had expressed concern at a likely increase in illegal buildings if all owners had to do was pay a fine, adding that the Ministry would reexamine the document.